Hawaii's Stephen Verwers, right, battled Pacific's Michael White for the rebound in last night's Great Alaska Shootout tournament in Anchorage, Alaska. ANCHORAGE, Alaska » In an auditory move some might hear as played out or contrived, Sullivan Arena officials welcomed the Hawaii basketball team to and from the floor last night with the playing of the "Hawaii Five-0" theme song. But the Rainbows Warriors dig the tune and it showed in the way they tuned up Pacific 71-60 in the Great Alaska Shootout third-place game. "I love hearing it because it makes our guys feel like they are coming out at home," veteran Hawaii coach Riley Wallace said. "It's the (ring tone) on my phone. I'm very proud to be a Rainbow." Senior Matt Lojeski bounced back strong with a game-high 22 points against Pacific after being held in check during Friday's 72-56 loss to California. Hawaii's defensive pressure also worked wonders. The Rainbows scored 17 of the first 21 points, converting a slew of steals into easy baskets. "The one thing we've lacked is consistency -- you never know how we're going to come out," Lojeski said. "Our consistency and intensity on the defensive end picked up tonight, and we fed off that." Junior point guard Matt Gibson also shook off a poor performance from the previous night with 13 points as the Rainbows (4-2) claimed third place in the annual Thanksgiving tournament for the second time in three trips since 1989. "We went 2-1 here and were disappointed to lose to (Cal)," said Gibson, who played a nondescript 18 minutes in the loss to the Golden Bears. "We would have liked to have had a little bit better show than that. "We're not complaining. It's a long road ahead." Speaking of the road, Hawaii remains on it. The team left Anchorage early this morning en route to Santa Clara, Calif., and a Wednesday clash with the Broncos. The Rainbows return home in time to welcome UNLV to the Stan Sheriff Center on Dec. 5. When they get there, Gibson figures the school's pep band will serenade the Rainbows with the familiar surf-terrific notes from "Hawaii Five-O." The sound of it from the Sullivan Arena speakers proved a pleasant surprise during the Shootout. "On the road, we don't hear that very often," Gibson said. "They don't usually give us a theme song like that, but we appreciate it. Hearing it puts us right back in the Stan Sheriff. It's not as good as hearing it from our band, but we'll take it." Wallace certainly didn't sing a happy tune after Friday's debacle in the Shootout semifinals. He called the loss an "embarrassment" and put the Rainbows through their paces in a full practice at Anchorage's Dimond High School earlier in the day. Fair to say, Hawaii worked out any remaining frustration once they hit the Sullivan floor with Pacific. Gibson scored the team's first five points, including a steal and 3-pointer 98 seconds in. Lojeski, Bobby Nash and Stephen Verwers teamed to produce an 8-0 run -- the first of two in the first 12 minutes. Riley Luettgerodt's putback with 8:12 left in the half stretched the lead to 25-9. "We took control early and had the energy," Wallace said. "We had to get out of here with two wins." Pacific may have likely been reeling from Friday's double-overtime loss to Loyola Marymount. The Tigers squandered a 14-point second-half lead before falling to the Lions. But against Hawaii, Pacific inside force Anthony Brown (19 points, 11 rebounds) was the team's only consistent option. 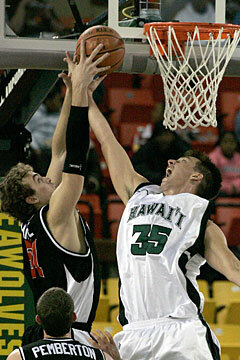 UH won the rebound battle 35-24 and struggled little to create whatever looks at the basket it wanted. Although Pacific outscored Hawaii 40-37 in the second half, the Rainbows never wavered. Lojeski gave the thousands in attendance a real ooh and aah moment with 16:27 left in the game. Lojeski took a Verwers feed along the right wing and emphatically hammer-dunked the ball in with his right hand. At that point, the Rainbows enjoyed a 45-28 lead. Gibson said last night's win showed what kind of team Hawaii can be. "We've got people who can step up at every position," he said. "We've said it from the beginning, there are no superstars on this team. We trust each other and depend on each other. "(Last night) there wasn't a lot of talk about rebounding. There was a lot of action. We didn't speak about what we had to do -- we came out and did it." 3-point goals -- Pacific 8-19 (Morgan 4-5, Neimeyer 1-1, White 1-1, HorseChief 1-2, Vezia 1-3, Pemberton 0-1, Esparaza 0-1, Raffety 0-2, Johnson 0-3), Hawaii 5-14 (Gibson 3-7, Lojeski 1-1, Waters 1-3, Luettgerodt 0-1, Nash 0-2). Personal fouls -- Pacific 11, Hawaii 13. Steals -- Pacific 6 (Morgan 2, Brown, Neimeyer, Garrett, Vezia), Hawaii 13 (Lojeski 5, nash 4, Gibson 3, Gueye). Blocked shots -- Pacific 6 (Brown 3, White, Johnson, Vezia), Hawaii 4 (Lojeski 2, Gueye, Owsley). Turnovers -- Pacific 19 (Brown 6, White 3, Johnson 3, Pemberton 2, Neimeyer 2, Esparaza, Morgan, Raffety), Hawaii 15 (Waters 3, Nash 3, Gueye 2, Verwers 2, Gibson 2, Lojeski 2, Follmer). Officials -- Lonnie Dixon, Bill McNew, Martin Cota. A -- 6,532.